How did we reach this Pax Romana of poultry? It wasn’t long ago that the fried chicken sandwich was relegated to fast food, squished between oblong buns and shredded iceberg. But when Vinny Dotolo and Jon Shook put a two-fisted craggy chicken sandwich on the menu at their seafood spot Son of a Gun in 2011—influenced by both Chick-fil-A and Oakland’s Bakesale Betty—it had the same transformative effect on the local culinary scene as Sang Yoon’s gourmet burger did when it debuted years before at Father’s Office. The appeal, in hindsight, was obvious. Upgrading an all-American creation with haute techniques, pedigreed birds, and inventive toppings transformed a food that was merely good into an object of obsession. Despite the popularity, there’s little consensus on what makes the ideal sandwich. Some chefs swear by the fattier thigh; others, by the plumper breast. Bun types are matters of debate (Pizza Romana serves its as a panini on twin slabs of pizza crust). Most agree that a snappy pickled topping is key, as well as a creamy spread, but even those are just guidelines. 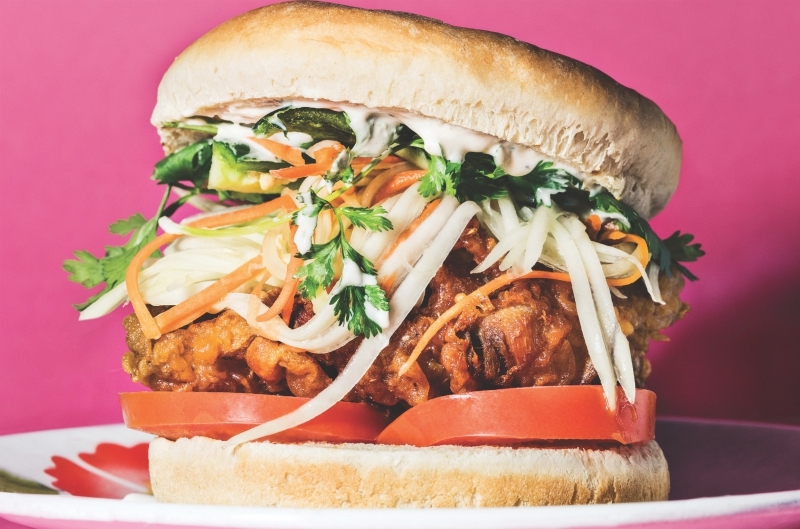 If you want evidence that the sandwich is the ultimate blank canvas of 2018, look no farther than South City Fried Chicken, which opened inside downtown’s Corporation Food Hall in February. Samuel Monsour, the Carolina chef behind Preux & Proper, serves eight towering varieties with Southern city themes. So the Austin is topped with red bean hummus and tortilla chips, while the Miami is brushed with jerk spice and lemongrass rémoulade. Should he decide, someday, to construct one as a love letter to L.A., there will certainly be no shortage of inspiration. Hot (and Numbing) Scoop: Panda Express Is Testing Out “Sichuan Hot Chicken” in L.A.